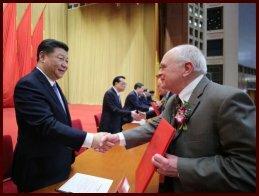 Distinguished Professor, Jan D. Miller, Department of Metallurgical Engineering, College of Mines and Earth Sciences, University of Utah, received the prestigious International Science and Technology Cooperation Award of the People's Republic of China in Beijing on 8 January 2019. The award, presented by President Xi Jinping at a special ceremony in the Great Hall, was in recognition for Miller's cooperation in education and research with Chinese universities and research institutions on the processing of energy and mineral resources. During the past decades Professor Miller has traveled to China more than a dozen times, visiting 16 provinces to discuss, advise, and collaborate on research involving coal, potash, phosphate, bauxite, and other basic metal resources. The cooperation with China has included lectures, workshops, and research projects with Kunming University of Science and Technology, Shanxi University and Central South University, for example, and has involved more than 100 Chinese students/researchers who have visited and/or studied with Miller’s group at the University of Utah.